Grace Stevens is the owner and founder of Cupcakes by Design. She is a Cape Town based cake decorator, instructor and author of two books. 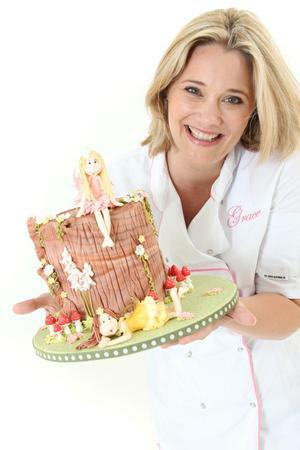 Her first book, Celebration Cakes, Step by Step with Fondant (Struik) was awarded the Gourmand Award for the Best South African Dessert Book in 2012. Grace is a member of the South African Cake Decorators Guild and has been awarded Gold, Silver and Bronze awards for her cake entries in numerous competitions. She regularly demonstrates throughout South Africa at guild meetings and shows. Since 2012, Grace has been a tutor at Pretty Witty Cakes, the world’s largest online cake school, which boasts students from 56 countries. She travels to the UK each year to teach workshops and to record online classes. She has written photo tutorials for both South African and UK based Chef and Decorating Magazines. Grace is a guest chef on South Africa’s local Morning show, Expresso Morning Live, showcasing her recipes for amazing desserts, sweet dishes and decorating ideas.